In June 2017 at the General Assembly in Paris the ENCJ adopted its Strategic Plan 2018-2021. The first work plan to implement the strategy was the ENCJ work plan 2017-2018. At the General Assembly in Lisbon in 2018 the ENCJ work plan 2018-2019 was adopted. The new strategy takes into account the outcomes of the 2016-2017 ENCJ survey among judges on their independence which revealed a number of important issues that need to be addressed. The first one reflects on the functioning of the Councils for the Judiciary and relates to the appointment and promotion of judges. Across Europe the perception of judges is that judges have been appointed and/or promoted other than on the basis of capacity and experience. Other issues are pressure from the media which judges feel do not respect their independence and relations with the other State Powers. Another more fundamental issue which affects the core of Councils for the Judiciary and ENCJ, is that a substantial number of judges feel that their Council does not have the appropriate mechanisms and procedures in order to defend judicial independence effectively. All these issues have to be examined from a perspective of structural safeguards and their effectiveness in practice. For the four-year plan, recent developments in the EU have also been taken into account. These developments include the now widely accepted notion of the economic value of a well-functioning justice system. It also takes into account the increasing need for resilient justice systems that can withstand external pressure but that have the ability to adjust to the changing needs of society. 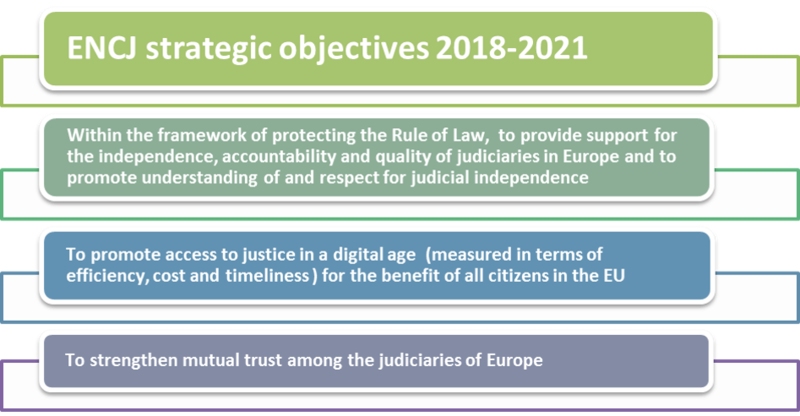 ENCJ will continue to cooperate with the European Commission on the further development of the Justice Scoreboard particularly in the field of independence and possibly quality. As such, the ENCJ feeds the policy development of the European Commission in this area. The ENCJ agrees with the Commission that a key requirement for mutual trust is the independence, quality and efficiency of the judicial systems and the respect of the rule of law. The ENCJ will strive to increase the impact of its work by more intense interaction and cooperation with relevant stakeholders and organisations such as the Fundamental Rights Agency (FRA) the lawyers (CCBE); academics, experts in the field of public opinion management, the EJTN etc. The focus of the activities will be on increasing the impact of the ENCJ and the improvement of justice systems. There will be less emphasis on project teams producing reports containing ENCJ standards and guidelines and more on implementation of the standards and guidelines thus far, and interaction between Councils and their representatives. Various new formats will be introduced including intensive workshops and seminars with an aim to promote dialogue and change. The previous plan was adopted in 2014 ENCJ four year plan 2014-2018.